While talking over party plans with my friend, I told her that Sheridan was going to have an Ice Skating party in November. The colors are going to be lavender and ice blue and lots of snowflakes. Enter Sheridan. "No Mommy. I want to have my party at the Santa Barbara Zoo". Don't you just love it when your kids switch gears on you? I needed new inspiration NOW so I checked out Etsy. They always have original and creative things (that's what I'm ALL about!) Most of the zoo/safari partyware was a little to "baby shower/1st birthday" for me. Then I found this adorable banner in giraffe paper with fuschia/lime/orange paper by wburley74. Very girlie and sophisticated! It will be hung up by bamboo poles. I went on the zoo website to check out the different party locations. I chose the 3 hexagon tables on a big grassy area. 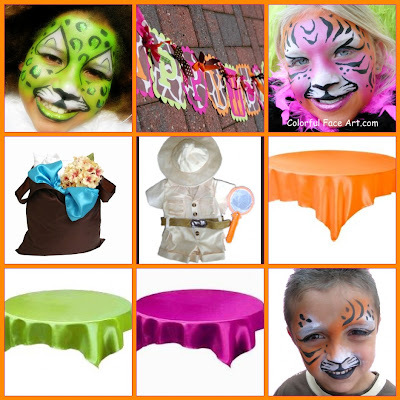 I ordered satin tablecloths from http://www.efavormart.com/ in fuschia, lime and orange. They will lay over chocolate round tablecloths. I know I want the kids to stuff animals as part of their favors so I bought reusable shopping bags in chocolate from efavormart as well. I will have a decorative tag to match the banner on each for the guests to carry their animal around in while they are enjoying the zoo. Each animal will also get a zookeeper outfit to wear. My friend Risa at Colorful Face Art posted these amazing faces on her blog. A great alternative to the usual animal faces. I'm going to visit her in July so maybe I can pick up some tips! Any ideas for the centerpieces? What about animal shaped lollipops or cookies set in either vases or cute little pots with shredded green paper as grass. Can't wait to see what you come up with! How cute! I know what you mean about when you have one idea planned out and then the child decides they want something different. I'm with you on the year planning. You really need that to come up with different ideas and find unique items that are not the run of the mill type items. I'm sure you will put the best zoo theme party ever! I love the zoo idea and the face painting is just wonderful. Zoo party sounds absolutely fun! I think it would be cute to get toy safari cars and other mini plastic toy animals and arrange them on each table like a safari scene. Or you can maybe find safari hats and put them on their backs, filling the inside with some type of moss and grass and birds. I did a zoo party many years ago and I utilized pineapples and fern leaves to create palm trees. The pineapple made a great tree trunk and I then used animal faced pillows from oriental trading peeking out of the tree. I will have to forward you pictures. They came out great. i used palm trees that i bought from the dollar store, added bananas, and animal blocks from the oriental trading company (they have removable appendages and come in packages of 12).